A few weeks ago, a writer from my high school's newspaper, The Paper Tiger, reached out to me to see if she could interview me for their literary magazine. She found me on Instagram, and sent over some of the most interesting and thought-provoking questions I've gotten in a while! Here's a repost of the interview in full. Enjoy! 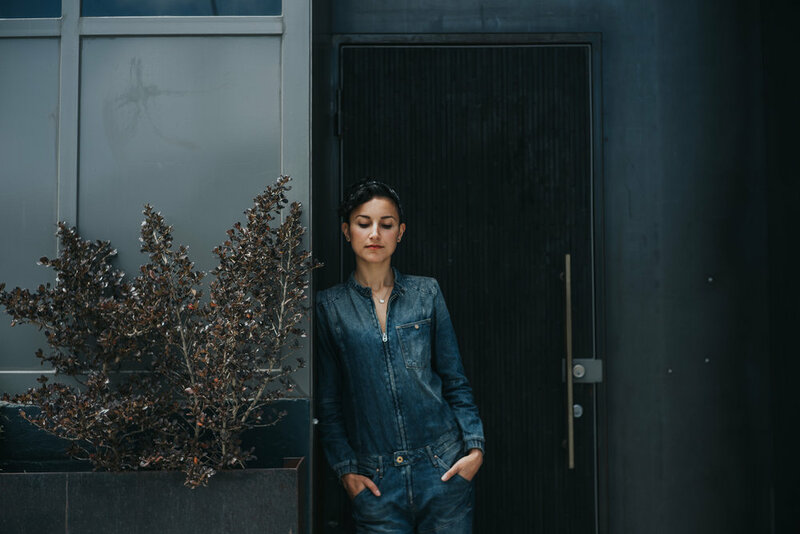 For this week’s LitMag interview, we interviewed Zai Divecha, designer, metalworker and owner of Elektra Steel (and an ‘06 LW alum!). As Elektra Steel’s website states, the company produces unique mosaic wall hangings. Zai specializes in the very precise, flexible type of welding called TIG welding, which allows her to create her bold, detailed work. Check out Zai’s work at www.elektrasteel.com or follow her company on Instagram at @elektrasteel. How did you first get involved with metalworking? 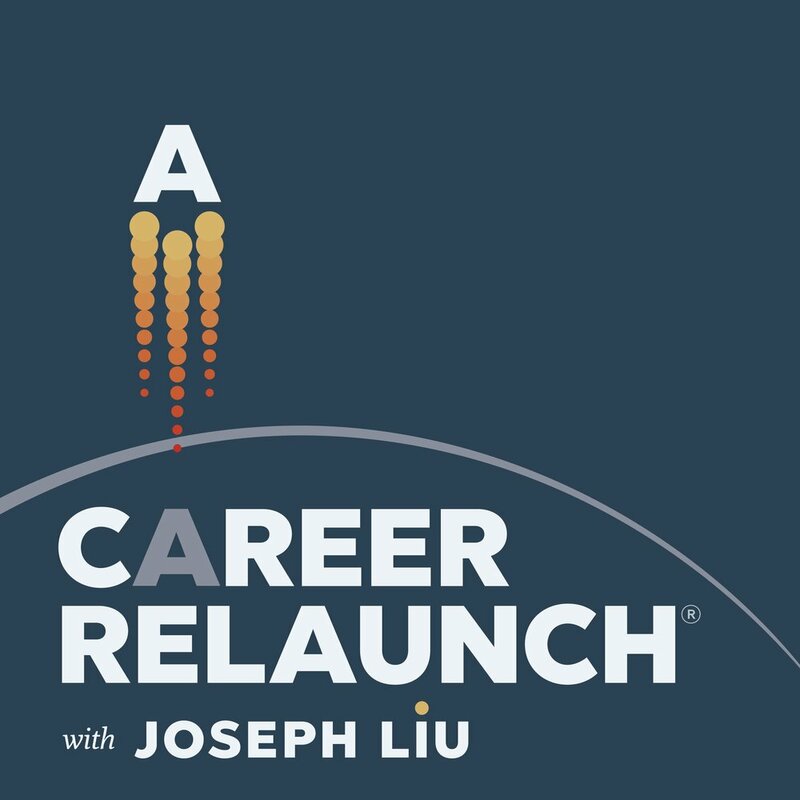 What advice would you give to people looking to take a similar career path? 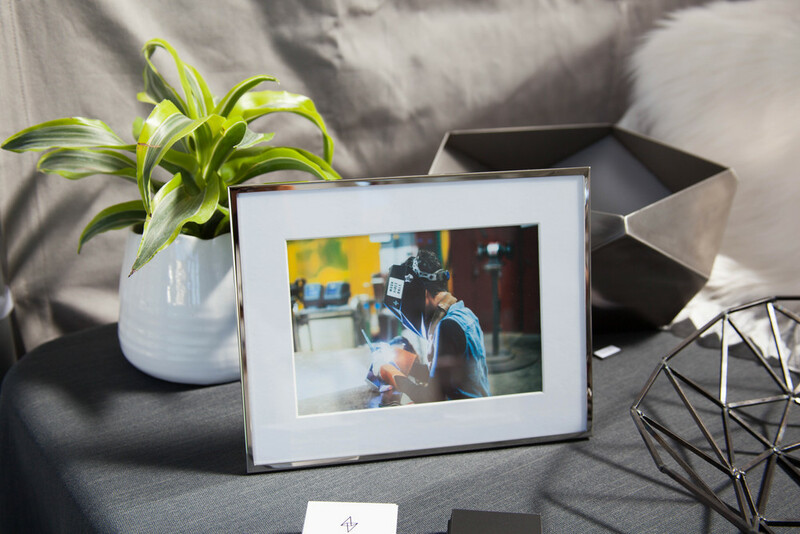 I first got into metalworking at age 14, as a high school student right here at Lick-Wilmerding! I knew I liked art when I first got to Lick, but I knew nothing about metalworking, and to be honest, I was a little scared of the shops. Once I learned the basics in the metal shop and started to feel a little more comfortable with the tools, I fell in love. I realized I could create furniture and home goods from scratch. It was deeply empowering. It took me a while to figure out that I wanted to do metalworking as a career, though — I studied other subjects in college and grad school (psychology, public health) and worked in a few different fields (nonprofit, tech) before diving into the art world full-time. It’s okay to change your mind a few times. If you think you might want to pursue art for a career, the most important thing you can do right now is to start building up your portfolio. Make as much art as you can, and take photos of both the process and the finished pieces. Research “product photography” online — there’s a lot of great information out there about how to take high-quality photos of your pieces. Once you have a few pieces photographed, create a simple website and an Instagram account to show off your work. Whether you’re applying to art programs or just showing your work to a family member, it’s incredibly helpful to have photos of your work gathered nicely in one (or two) places. If you know you want to pursue art as a career, you could go to an art school for college, or attend a liberal arts school that has a strong visual arts program. But you don’t have to go to school for art — I didn’t! If you’re not sure you want to commit to going to art school, explore art in your free time instead: You could take summer or evening classes at a place like The Crucible in Oakland, or TechShop in San Francisco. Is there a specific person you look up to who has inspired your artwork or influenced you in general? The most important person who shaped me as an artist was Mr. Clifford, who was the metal shop teacher when I was a student at Lick. He introduced me to metalworking, and helped me build my confidence in the shop. He pushed me out of my comfort zone, encouraging me to tackle more complex skills, like TIG welding and anodizing. Over a decade later, I still consider him a mentor. Two years ago, I went to him for advice when I was starting Elektra Steel, my company. He gave me encouraging, specific, and practical advice, and it helped me prepare to take the leap. Many of your art works are installed or photographed in very specific places — when you create these pieces do you think a lot about your audience and the space you’d want them to be in, or not? Depends on the piece! Some of my pieces were commissioned by clients — they hired me to make a piece for a specific location, like over their fireplace, or in a conference room. In that case, I definitely take into consideration how the space is decorated and lit, how and where the piece will be hung, and who the audience will be. But sometimes I just make a piece for fun, and then afterward try to find a customer to buy it. In that scenario, I’m less concerned about the audience and the space, and more focused on just making what I want to make. What do you hope people learn or take away from looking at your art pieces? Right now, my main goal is for people to look at my work and just think it looks cool. My priority at the moment is to refine my fabrication techniques, develop a coherent aesthetic, and make stuff that people like. That said, I’d like to eventually make pieces that tell a story and have messages embedded! Obviously the field of fabrication has been traditionally dominated by men — how does this disproportionate representation affect the way you work? Great question! My feelings about it are complex. Sometimes I love that I’m a woman in a male-dominated field. The fact that I’m a woman who learned to weld at age 14 is a unique and memorable story, and I certainly use that narrative to my advantage in my marketing and branding efforts. But other times, I feel annoyed. Some men in the field don’t take me seriously, or they try to “mansplain” things to me in a condescending way. At a previous metal shop, where most of the folks were white men, I experienced subtle sexism on a regular basis. Staffers would ask things like, “So, are you here for the jewelry class?” just because I was a woman (I was actually there for the waterjet cutting class). They constantly made assumptions about what type of work I was there to do. Other members of the shop would come over and try to tell me how to use a tool, even when I clearly wasn’t looking for help. I felt like I was constantly on the defensive, trying to prove to everyone that I was a competent metalworker. I think it helped me grow a thicker skin, but it wasn’t always fun, and it certainly distracted me from my work. But at my next shop, The Crucible, I had a totally different experience. The community there was much more diverse — there were lots of women, folks of color, and queer and trans people. I never once experienced sexism or felt self-conscious about my identity as a woman (or as a queer person of color, for that matter), and I had talented role models all around me who looked like me. I felt so much more confident and comfortable in that space! And since then, I’ve made an effort to find friends and mentors who are other strong women who run their own small businesses. I’ve learned so much from them, and we help each other out constantly. Their advice and support has helped me grow tremendously. I'm the Featured Designer of the Week over at London's Deck Studios! Check out the interview I did with their founders, Ed & Sin. They put together a really beautiful montage of photos for the piece -- a nice mix of product photography and behind-the-scenes process shots. Below is a screen capture, but head over to the article to read the full interview! I recently wrapped up a commission piece for a wonderful couple, Michael and Salma. They were so much fun to work with, and I’m really happy with how the piece turned out! Michael Wornick in front of two Orozco pieces from his collection. I met Michael at Renegade Craft Fair in April — he came by my booth and struck up a conversation. We chatted about art and design. He's an art collector who owns a number of sketches by Mexican muralist José Clemente Orozco. He and his partner had just bought a beautiful home in Sonoma, California, and they were looking for something bold (and fairly heat-resistant) to hang over their fireplace. During our conversation about what kinds of imagery he’s drawn to, he mentioned that he loved the kinds of patterns found in Islamic art. He also said that he liked my aesthetic, and didn’t want to give me too many restrictions or guidelines — he wanted to see what I’d come up with (#dreamclient). Below are some process photos: the reference image I started with, some sketches in my notebook, a CAD drawing, the lasercut steel parts, an array of parts in various stages of sanding, staining, and waxing, and finally, the assembly. Interested in a custom piece of your own? Fill out this form and let's discuss! Exciting news: Two of my pieces are now on display at Harmonic Brewing in San Francisco! Harmonic is a fantastic craft brewery in the Dogpatch that makes 10+ interesting and seasonal beers. Their taproom is open to the public five nights a week, and it's become my favorite place to unwind after a long day in the metal shop. I've gotten to know Harmonic's founders, Eddie Gobbo, Jon Verna, and Eric Tisch, over the last few months because we're neighbors -- we all share a roof over at ShopFloor Design (hence my new happy hour habit). If you're on this side of town, come by for a drink, some cheesy popcorn, and a peek at these two wall hangings! Harmonic Brewing is located at 1050 26th Street in San Francisco, and their taproom is open Wednesday through Sunday. Fun fact: You can bring your kids, your dog, and outside food into the taproom. So round up your crew and make an evening out of it! Check out their website for hours and more info. And if you're interested in purchasing either of these two pieces, email me at zai@elektrasteel.com. Cheers! I just finished up a custom piece with an extra special backstory: Two of my mom's colleagues hired me to make an anniversary gift for my own parents -- as a surprise! My mom, Diana Divecha, is a developmental psychologist who works with the Yale Center for Emotional Intelligence. She and her colleagues, Robin Stern and Marc Brackett, publish editorials, speak at conferences, and educate experts about how social and emotional learning programs benefit kids and teens. When Robin and Marc came to me with the idea for a custom piece for my parents, their only request was that I create a representation of the Mood Meter. Robin and Marc gave me tons of creative freedom with regard to the style, aesthetic, and materials, which was such a treat for me! I ended up creating a large, square mosaic made out of sheet steel. I took the graph and tipped it on a corner -- diamonds felt more dynamic than squares. If you've seen my work before, you probably know that my color palette is pretty subdued (both my portfolio and my closet could be described as "Fifty Shades of Gray"). I used a variety of finishing techniques -- staining, sanding, sandblasting, waxing -- to create tones in the steel ranging from bright silver to a dark slate gray. There's a subtle ombré from bottom to top: The lower half of the piece is a bit darker, to reflect lower-energy emotions, while the upper half has brighter, shinier steel tones, to symbolize higher-energy emotions. Robin requested small splashes of color as a nod to the Mood Meter, so I painted four small triangles with the original quadrant colors. Lastly, I welded a simple frame out of steel flatbar to give the piece a polished edge. Needless to say, my parents were pretty stunned when they saw the piece -- they couldn't believe that Robin, Marc, and I had managed to keep this project a secret from them for months! It wasn't easy, though. I'm very close to my parents, and there were many times when I was tempted to gush to them about what I was working on. But I kept my lips zipped, and they loved the surprise! "That you were able to create a piece of art that expresses our love and appreciation for you and your family brings great joy and satisfaction to us," wrote Marc. "It’s a gorgeous piece of art with a subtle reminder that each day thousands of children and adults are learning the skills they need to become talented and caring people." Want your own custom wall hanging like this? Email me and let's discuss! Renegade Craft Fair is one of my all-time favorite fairs in San Francisco -- the work is beautiful, the space at Fort Mason is stunning, and the vibe is fun. And for the very first time, I got to participate as a seller rather than as a shopper! 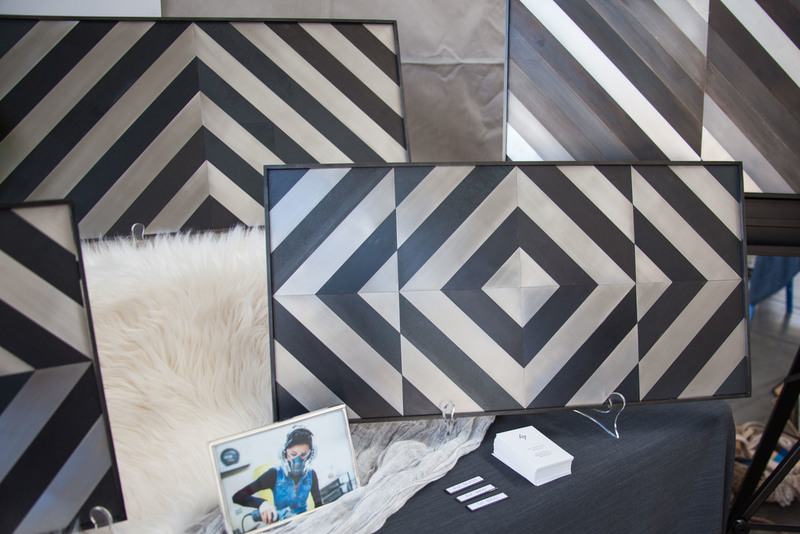 At the show, I debuted my collection of steel mosaic wall hangings. I had no idea how it would go -- it was pretty different from the faceted vessels I'd making previously -- and I wasn't sure what to expect. But people loved them! They were drawn to the bold shapes and patterns, and many had questions for me about how I'd made them. I'm currently working on several large commission jobs in this style, but with more complex patterns and tones. I'm really loving this current direction, and I'm excited to keep exploring this path in my work! This June, I'll be participating in AIDS/LifeCycle, which is a seven-day, 545-mile bike ride from SF to LA. It's a massive fundraiser that supports the San Francisco AIDS Foundation and the Los Angeles LGBT Center, two organizations that are doing crucial, life-saving work to curb the AIDS epidemic in California. Over the next month, I'm planning to raise $3,000 for the San Francisco AIDS Foundation. To make this fun for everyone, I'm hosting an art raffle: I'll be giving away six unique, handcrafted prizes! Three of them were made by yours truly, and the other three were made -- and generously donated! -- by my insanely talented friends Nicole Sweeney, Jasmin Pamukcu, and Jeff Goodwin from Krakatoa Design. For every $20 that you donate toward my fundraising, you'll earn one ticket in the raffle. I'm going to divide up the drawing into six individual rounds. After I sell 25 tickets, I'll randomly draw a winner and raffle off the first prize. Once I sell the the next 25 tickets, I'll raffle off the second prize. I'll keep going like this until I've sold a total of 150 tickets and raffled off all six prizes. Take a peek at my scoreboard spreadsheet if you're having a hard time visualizing the structure of this contest. The fun part: All tickets will stay in the pool for subsequent rounds! So if you buy a few tickets in the first round, they'll stay in the pool for Rounds 2, 3, 4, 5, and 6! (Winning tickets, however, will be removed from the pool for subsequent rounds.) If you want to maximize your odds of winning a prize, make sure to donate sooner rather than later! Donate online with a credit card here. I'd recommend donating in increments of $20, as $20 equals one raffle ticket. So for example, if you donate $200, you'll earn 10 tickets in the raffle. You can check the scoreboard at any time to see where we are in the raffle, and who's won so far! This is a teeny little stand that I designed and welded from blackened steel bar and stainless sheet steel. At only 7" high, it's perfect for displaying your tiniest treasures: air plants, jewelry, or maybe a votive candle. It normally retails for $60. My best friend Jasmin Pamukcu generously contributed this beautiful, framed ink drawing of Amaterasu Omikami, the Shinto goddess of the sun. Earlier this spring, she raised money for a service trip to Cambodia by creating a coloring book featuring powerful goddesses from around the world. Enter the contest to win this original drawing of Amaterasu Omikami, which is worth $150. And if you want to learn more about her Global Goddesses Coloring Book project, you can read about it here! Remember those nesting triangular tables I made with my kickass woodworker friend a few months ago? Well, that kickass woodworker was Nicole Sweeney, and I was over the moon when she told me that she'd contribute one of her bold triangular wall hangings for my raffle! This striking piece is 24" wide, and she'd normally sell it for $150. If you don't end up winning this piece in the raffle, you can always head over to her online shop and see what's for sale! My very good friend Jeff Goodwin (the mastermind behind Krakatoa Design) makes all kinds of things out of both wood and metal -- benches, display cases, crazy wood-and-leather bags, cutting boards, spoons, you name it! This particular piece has become one of his signature items in the last few years. Part bulletin board, part cartographic wall art, these cork maps offer a new way to show off your 'hood. Mark out your favorite haunts, or plot all the places you've been meaning to check out. This map of San Francisco has been laser etched into a thick cork sheet, and is suspended between solid walnut hanging bars. The map is 24"x24" (slightly larger with the frame), and it normally sells for $160. Enter the raffle to win this beauty! And if you can't wait until the drawing, check out Krakatoa Design's online store! This elegant tabletop stand features a slab of reclaimed marble with raw edges. The asymmetrical steel base was welded together, blackened with a dark patina, and then sealed with a deep blue metal oil to protect the finish. The Marble Prism Stand can serve as a standalone art object, or it can be used to showcase small treasures on one's vanity, kitchen counter, or desk. It's roughly 13" long x 8" wide x 5" high, and normally sells for $250. 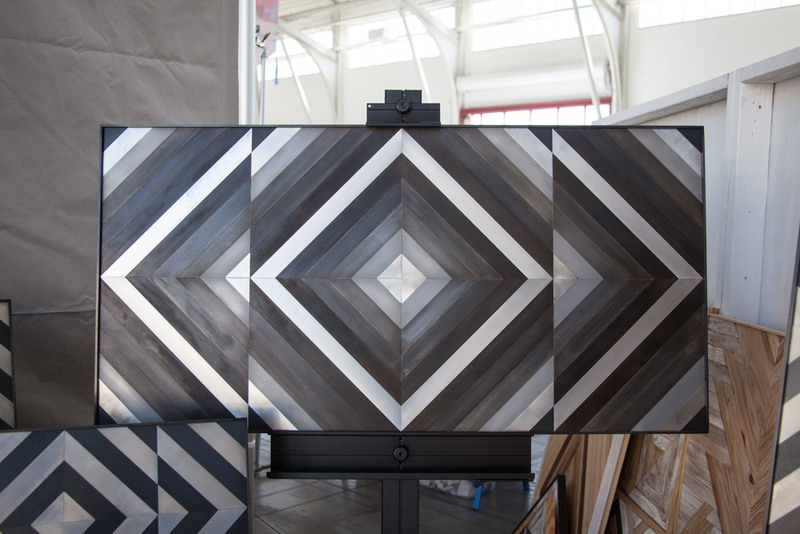 This bold wall hanging was made from a mix of bright stainless steel and blackened mild steel. The parts were lasercut and carefully finished, sanded, and sealed by hand, and then mounted to a wood backing. A welded steel flatbar frame gives it a solid heft. This piece is 1'x1', and it includes a z-clip for mounting. This piece retails for $250. I participate in AIDS/LifeCycle every year for a number of reasons. I first got involved because the focus of my master's thesis research was HIV/AIDS, STIs, and sexual and reproductive health, and I wanted to find ways to support the cause outside of academia. I fell in love with AIDS/LifeCycle, and I kept coming back for more. This will be my fifth year in a row participating in AIDS/LifeCycle. I ride because I have friends who have have been touched by HIV or AIDS, and I see that the fight isn't over. I ride because the federal government still refuses to fund effective harm-reduction programs like clean needle exchanges -- which means that we rely on private donations to keep these services afloat. I ride because I love the AIDS/LifeCycle community -- including everyone who has ever donated! -- and what we can accomplish together. I did a pop-up shop at the Bay Street West Elm in Emeryville, CA, on April 9th and 10th! I had some great conversations, and sold a handful of pieces, including a few Geo Bowls. Best of all, I got encouraging feedback on the large wall hanging -- people seemed really drawn to it! Check out the slideshow to check out my set-up. Check it out -- I'm in one of my all-time favorite design blogs, Design*Sponge! They put together a nice little shop tour that features me, my dog Simi, and my favorite metal shop tools. Come take a peek inside my studio! 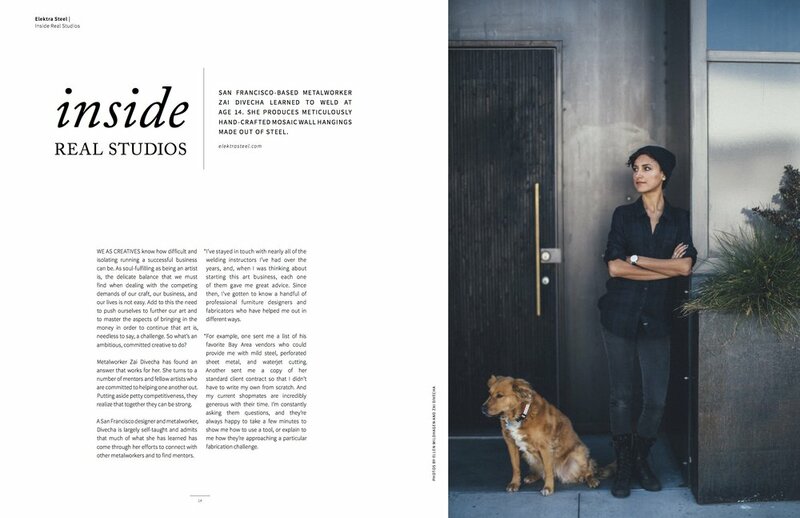 Major thanks to Sabrina Smelko from Design*Sponge for this lovely write-up! I designed and fabricated these three Marble Prism Stands for La Bijouterie, my favorite jeweler in San Francisco. I met Set, the owner, because he designed and made my beautiful engagement ring. A few months later, he hired me to make these stands for his window displays! Want a Marble Prism Stand for yourself? There's one available in my shop, and if you'd like a custom one, email me and we'll make it happen! Over the last few months, I've noticed a really wonderful trend: Customers have started sending me photos of how they're using their purchases! It fills my heart with joy to see my pieces being used and loved and integrated into people's daily lives. So, I'm starting a new blog series to show off Elektra Steel pieces in their new homes! I'm kicking off the series with family friends Mary and Rob, who are some of my favorite repeat customers. Rob was my middle school math teacher, and their son was classmates with my little sister -- our families have known each other for a long time! Mary and Rob now have four Elektra Steel pieces: three Hex Votives and a Geo Planter. I love the way they've chosen to display and use these pieces! They're outside on a deck, surrounded by plants, flowers, beautiful votive candles, and, apparently, a glass of wine (#lifegoals, am I right?!). Thank you, Mary and Rob, for supporting my craft and my business from the very beginning, and for being such wonderful, loving people! And thank you for sending me these beautiful photos! Do you own an Elektra Steel piece? Send me some photos of it in its new home, and you could see them on the blog! I hosted my very first pop-up shop yesterday! The wonderful folks at the Palo Alto West Elm invited me to set up shop for a day -- I got to take over an entire dining table of theirs and sell my work! As you can see in the photos, it gave me an opportunity to debut my newest piece, a large 2D steel wall hanging. Almost everyone who walked by stopped to comment on it! It was validating to hear that people like this new direction -- I'm hoping to do a whole series of pieces like this. I have two more West Elm pop-ups on the books for this spring! I'll be at the Bay Street / Emeryville location April 9-10 and May 21-22. Check out my upcoming events for the full list of opportunities to shop Elektra Steel in person! Photographers Elle Wildhagen and Zachary Domes put together this beautiful piece about me for their project, The New Americans. It features 20 people across the U.S. with completely different lives and stories -- each one is poignant and thoughtful its own way. In my story, I talk about welding, impostor syndrome, and "mansplaining" in the metal shop. It's clear that Elle and Zach are master storytellers, in addition to being skilled photographers. I loved talking with them, and showing them around the shop. I felt like they really "got" me -- It felt so good to be seen and heard and understood. What a gift. Check out the other 19 stories at The New Americans. 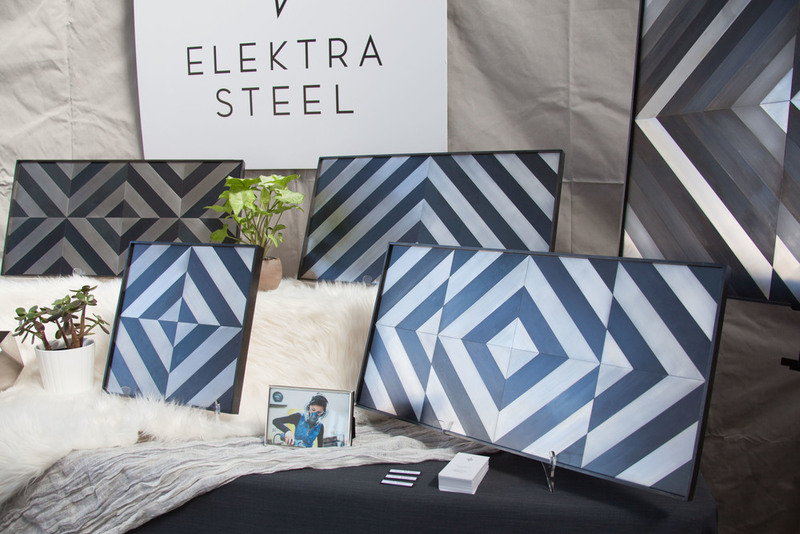 Check out February's newsletter for some new marble + steel pieces and details on Elektra Steel's first flash giveaway! Want to get the newsletter delivered to your inbox? Sign up here! UPDATE 2/18: Contest is now closed! The winner of this little welded sculpture is Instagram user @transitgal -- congratulations! (If you're curious about the drawing methodology, I recorded a screen-capture video of me using a random number generator to select the winner.) I will definitely be doing more giveaways in the future, so make sure to follow @elektrasteel on Instagram! FLASH GIVEAWAY!! Head over to Instagram to enter to win this little welded sculpture! Contest closes tomorrow, February 18th, at 12pm PST. See Instagram post for details and rules!